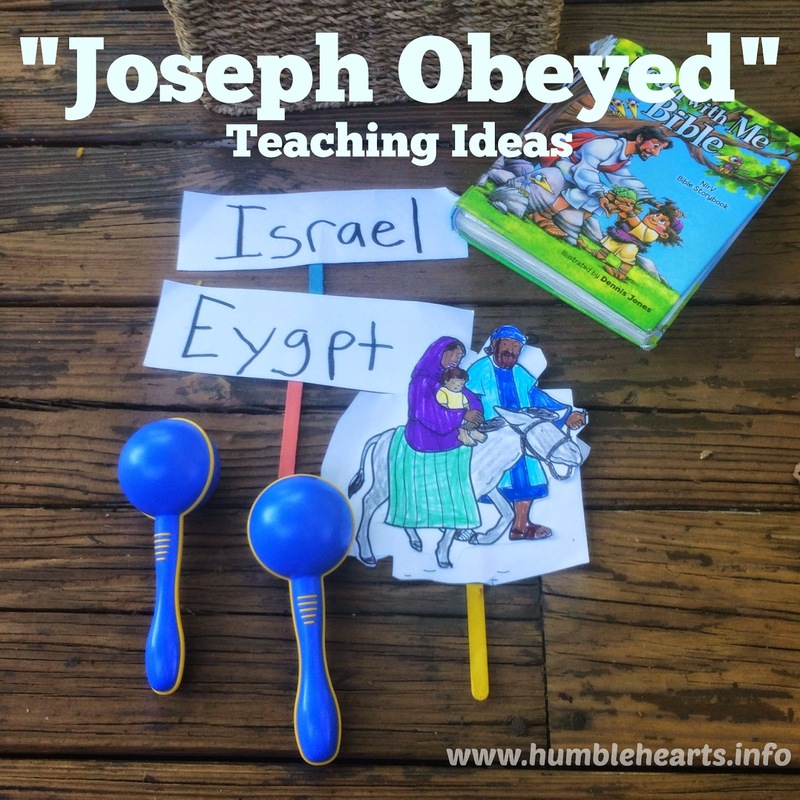 These teaching ideas for "Joseph Obeyed" relate to Jesus Christ's childhood. On this website there is another teaching called "Joseph Obeyed God" as a part of the "Obeying God" teaching series. Song: “Joseph Obeyed” from"Home Where the Word Lives" CD by Cindy Bernardini. Have your child play a maraca or shaker during the “Da-da” parts. God was Jesus’ father. Mary was Jesus’ mother. Joseph was married to Mary and helped to take care of Jesus. When Jesus was a toddler the Magi came to visit. God sent an angel to talk to Joseph. An angel gives a message from God. The message the angel told Joseph was to leave the town of Bethlehem and move to Egypt. It wasn’t safe for little Jesus in Bethlehem right then. Joseph obeyed and did what God told him to do. Joseph heard the Word of God, and did it. God told Joseph to travel to Egypt. Joseph obeyed. When it was safe for Jesus to go back to Israel, God had an angel give another message. The angel told him to move back to the land of Israel. Let’s see what Joseph did. (Read Matt 2:21) Joseph obeyed again! Joseph heard the Word of God the angel told him and he was a doer of God’s Word. We want to always obey what God tells us to do. God loves us. Adults have to obey God and children have to obey God. God tells children to obey their parents. God sent an angel to tell Joseph to take Mary and Jesus to Egypt. Joseph obeyed. (Hold up the “Egypt” sign and have your child pretend to travel to Egypt). God sent an angel to tell Joseph to take Mary and Jesus back to Israel. Joseph obeyed. (Hold up the “Israel” sign and have your child pretend to travel to Israel). More Songs: “Hear the Word Of God” from Gospel Light’s “Sunday School Preschool Songs #1” CD and “Doers of God’s Word” from George Hackett’s “Always Giving Thanks” CD. Print out James 1:22a on card stock. 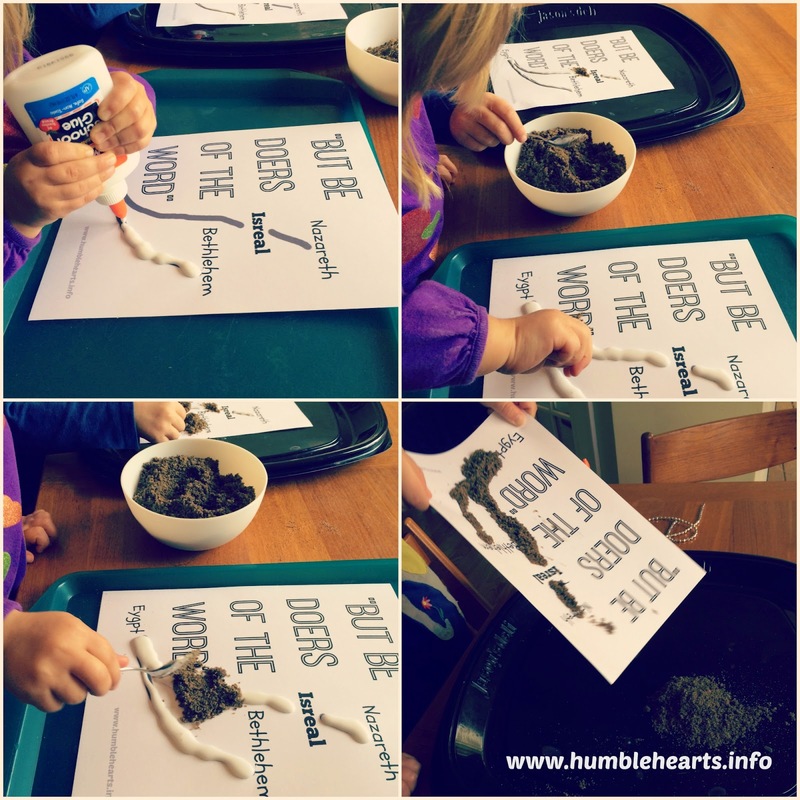 Have your child trace the road lines with glue. Sprinkle sand or dirt on the glue (this works best over a tray). Shake off the extra sand and let it dry.